The Aprilia Futura website has been in existence since 2008 as an information source for owners – and prospective owners of the Aprilia RST 1000 Futura. The information on this site has been checked and evaluated wherever possible and is based on the experiences of many owners. This site acts as a filter to ‘boil down’ the basic information and link out for more details. This website would not have been possible without the collective knowledge of Aprilia Futura owners the world over – the members of the AF1 Apriliaforum. The forum members were of immense help to me and countless other new Futura riders, and is the place to go for help and advice. Most of the technical information on this site came from forum members, and many of the images were sourced from there. In most cases I link back to the original source of information. 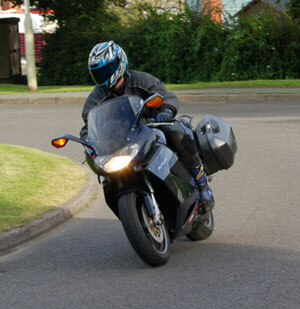 Me on my (sadly sold) Futura back in the day. The site launched in 2008 with around 90 pages and was added to over the following three years. In 2012 it was moved into the Joomla Content management System. This current version went live in June 2014 in WordPress, which has allowed greater flexibility and a mobile responsive design to display on all devices. The pages have been completely re-structured and mostly updated. This website was built by me, Patrick Barnes, as a means of combining my (then) day job as a website editor with my enthusiasm for my Aprilia Futura and the kindness shown to me by other owners. I bought my Futura new in 2005 and covered 22,000 miles, but in the end the bike had to go to help fund my website business, Moghill Web Services. Even though I don’t have the bike anymore, I’ll still keep the site live as long as I can. It’s taken almost 18 months to put this latest version together as it’s hard to find the time while trying to make a living! In the second incarnation of the site I experimented with Google Advertising but this doesn’t come near even covering the hosting costs. And ads are annoying. If you have found the site helpful in any way, please consider making a donation. If you have any comments, suggestions or ideas for the site then you can reach me via the contact form.